One of our New Year’s resolutions is to buy no more palm oil-containing packaged food. We have devised a menu that could be used to delight your guests, or simply keep on hand as a healthy treat. The pesto is particularly versatile: it makes a delicious dip, pasta sauce, pizza topping, or can be served with eggs to spice up your breakfast. The spelt crackers and pan-fried breads are a great alternative to the usual palm oil-laden variety. We made the following dishes from beginning to end in around 4 hours. The benefits: fresh, nutrient-rich food for you and a crowd of guests, with no palm oil, preservatives, stabilisers or additives. Oh yes, and they're delicious and enormously satisfying! Some of these recipes were adapted from those published in Green Lifestyle magazine, issue 47. Place spinach and rocket into a clean sink and cover with cold water to clean thoroughly. Transfer leaves to a heat-proof bowl and cover with boiling water and allow to wilt for 1 minute. Drain into a colander and rinse under cold water to stop the cooking process. Heat olive oil in a small frying pan and add the spring onions and garlic. Cook until onions and garlic are softened and translucent. Cool mixture. Add spinach, rocket, onion mix, tofu, feta, lemon and dill to a food processor and combine until dip is smooth. Season and top with lemon wedges and fresh dill. Preheat oven to 180c. Wash the beetroot and trim off any stems. Place onto a large sheet of foil, season with pepper and salt, and sprinkle with olive oil, then wrap tightly. Put the beetroots onto a baking tray and cook for 1 hour or until a skewer or shape knife goes through with ease. Allow to cool. Unwrap and rub off the skins under a running tap (gloves are recommended as beetroot will stain your hands). Chop and place into a food processor with the remaining ingredients, processing until smooth. Season to taste. Place basil and rocket into a clean sink and fill with cold water to remove any dirt or sand. Drain in a colander. Roughly chop garlic and add to processor with basil and rocket. Process until chopped. Add cheese, lemon juice and nuts and begin to pour in oil as processor is switched on. Consistency is up to personal taste but we like our pesto slightly chunky. Season well and transfer to a bowl. To keep pesto fresher for longer and to stop oxidisation pour a thin layer of olive oil on top and place in an air-tight bowl. Combine yeast, sugar and salt in a jug with ½ cup of lukewarm water. Allow to stand in a warm place until yeast is frothy. Place the spelt flour into a large mixing bowl with the herbs and create a well in the centre. Pour in the yeast mixture. Stir with a spoon and then knead with the hands to a smooth dough. Turn onto a lightly floured surface and knead for 5 minutes. Place dough into an oiled bowl and cover with a tea towel. Place in a warm place and allow to rise for 1 hour or until dough has at least doubled in size. Preheat oven to 180c and line 2 trays with baking parchment. Divide dough into 4. Roll out one portion as thinly as possible on a floured surface. Cut into rectangular strips or triangles and place onto prepared tray. Repeat with remaining dough. Bake for 7 minutes keeping a close eye as crackers start burning very quickly. Cool on a wire rack and sprinkle with salt. These will keep in an airtight container for up to 4 days. Put flour and baking powder in a food processor and whiz to combine. With the processor running and 1/3 cup of boiling water then add 1/3 cup of cold water. Once water has been added turn processor off and tip the dough onto a floured surface. Knead briefly until the dough is smooth. Form into a ball, cover and set aside at room temperature for 30 minutes. Divide the dough into 4 equal pieces, and roll each piece into a 25 cm circle. Using the back of a spoon spread a dessert spoon size of pesto over the surface and then roll up the dough like a swiss roll, concealing the pesto inside. Take the roll and coil from one end to coiled spiral. Repeat with remaining dough. Oil a frying pan well and apply a medium heat. Fry breads one at a time 3-5 minutes on each side until golden and crisp. We cut these into slices like a pizza, and served them with the dips. These are delicious served warm or at room temperature. They could also be used as a pizza base, with the topping of your choice – we suggest olive oil with fresh roughly chopped tomatoes, basil and fetta cheese. Gently heat the oil and lightly fry the garlic. Halve the tomatoes and heat, stirring until a little soft. Add lemon rind and capers and stir over heat until heated through. Remove from heat and stir the fresh herbs through before spooning over freshly cooked pasta. Your choice of fresh fruits - we used watermelon, honey dew melon, rock melon, grapes and passionfruit. Drain cashews from soaking water and rinse. Put into a food processor with remaining ingredients and mix until smooth and creamy. You may need to add a small amount of water to achieve the correct consistency. 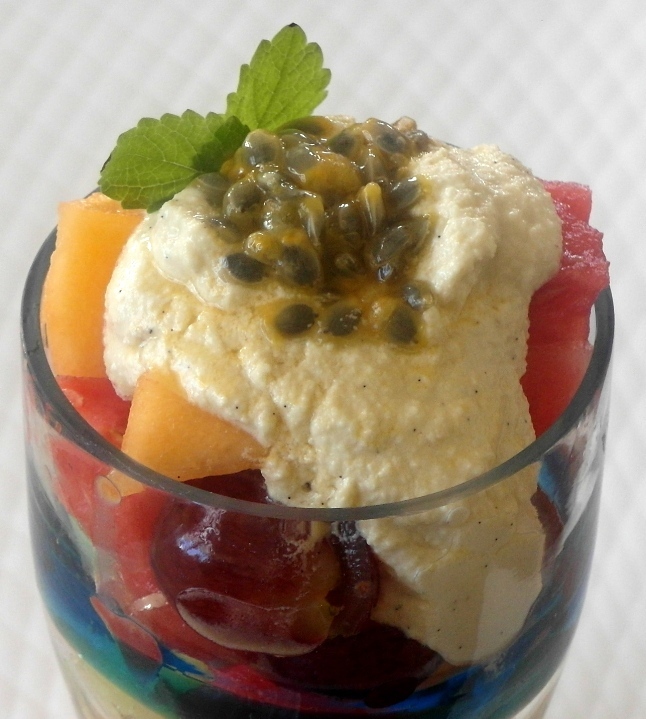 Serve fruit salad into glasses and spoon over the cashew cream. Top with fresh mint.